Welcome aboard the U.S.S. Enterprise D! Join the officers of the galaxy class starship and make it official with the Star Trek The Next Generation Command Jacket. 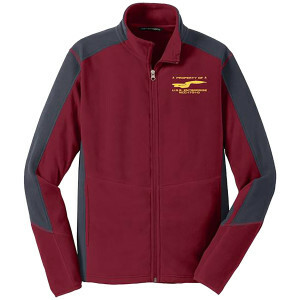 The Command Red and grey Fleece Jacket features an embroidered silhouette of the Starship Enterprise D along with “Property of U.S.S. Enterprise NCC-1701-D”. This jacket in your collection is the perfect identifier of a true fan. LOVE this jacket! Great fit and looks super sharp. I was on the fence about purchasing this but, with the holiday discount, am very glad I did. My wife is prepared to transport aboard the Enterprise! She is pleased. Great customer service, had to exchange for a smaller size, no problem. I love this jacket. Looks great and feels great! I'd recommend this to every TNG fan. This was a gift for my brother. He absolutely loves it!! It looks and wears comfortable. I definitely recommend! I love this jacket! I've worn it just about every day since I've gotten it. It's so soft and warm, it's perfect for this late autumn chill. And so far it's held up really well to several cycles through the washer and dryer. The only thing that would make me happier would be if I could get this in additional designs for TOS and ENT!